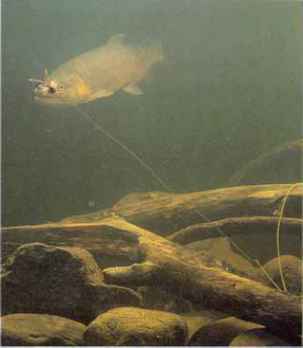 Flexibility is an operative word when it comes to trout fishing. If you are fishing one spot but not having much success, you need to relocate to another spot. Try to move in an upstream direction, looking for pools or pockets in the water. As you walk upstream, stop about every four feet and cast. This will allow you to cover just about every area of the water. Remember, you might fish one spot and catch nothing but move five feet and find a bunch of trout. Therefore, do not walk upstream and wait until you have gone 20, 30, or 40 feet before casting. Research shows that on average, a trout will strike about every seven out of 10 casts in one specific area. Therefore, even if fishing one spot, cast more than three times. If you have cast five times and had not bites, then it is time to move upstream about five feet and cast again. Unfortunately, if you were to sit back and watch some other anglers, you would see them cast several times in one spot but then walk a good distance upstream, completely walking past potential pockets of trout just waiting to be enticed. When you fish using this method, you will increase your catch by as much as 25%.